The Valley of Drakes is a Location in Dark Souls and Dark Souls Remastered. This small area is populated by infant dragons and acts as a hub to numerous other areas of Lordran. 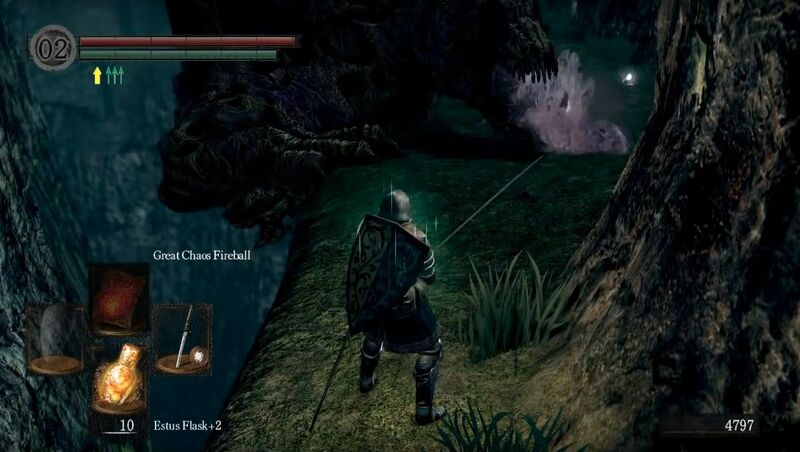 It has no boss in the traditional sense, no bonfire or any item you need to collect as part of the main quest and is hence non-essential; although you will inevitably end up visiting it at least once, likely during trips between Blighttown. It can be accessed right from the start of the game via New Londo Ruins as long as you picked the Master Key as your starting gift. After ringing the second Bell of Awakening, you'll be coming out of a cave, on your way to Firelink Shrine. 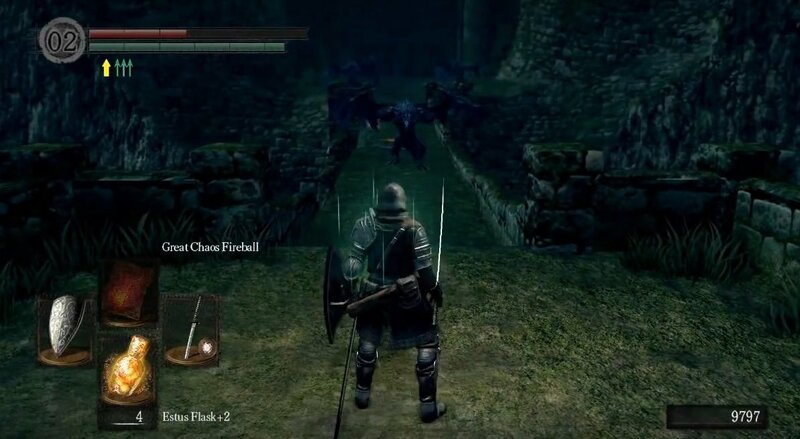 You'll notice a small wooden bridge ahead and a ledge leading to your left, cross the bridge and turn left to pick up a Large Soul of a Nameless Soldie, right beside a locked door - this door can be opened using the New Londo Ruins Key you picked up a minute ago from Blighttown (can also be unlocked with the Master Key). Through this door, you'll find a staircase that leads down to New Londo Ruins which can then take you back to Firelink Shrine to rest at a bonfire before you explore the rest of the Valley, should you so wish. (Note: If you go the other direction on this side of the bridge and continue until the ledge ends you'll be able to find the Witch Set and Beatrice's Catalyst - although they will only be present here if you beat the Four Kings in The Abyss). Cross back over the wooden bridge again and you'll see the cave on your right that leads down to Blighttown (Note: If you haven't been down in Blighttown yet then be aware that this entrance is actually a shortcut to finishing it, as it allows you to skip Lower Undead Burg and the Depths while also placing you closer to Quelaag's Domain and the areas boss) but following the ledge to the left will lead you to another larger bridge. Across the bridge and following the resulting ledge onward you will see a huge Undead Dragon hanging off the ledge - emphasis on the 'un' in 'Undead'. No matter how dead it may appear, it's very much capable of killing you. There are two very intriguing items that lay under its guard: Astora's Straight Sword, and a Dragon Crest Shield. Should you choose against acquiring these items, ignore the Dragon as it won't attack you if you give it a wide berth. Follow the path past the Dragon to pick up a Soul of a Proud Knight. If you want the items he's guarding you have two options: You can either kill it, or, you can attempt to rush for the items - which will most likely result in your death. 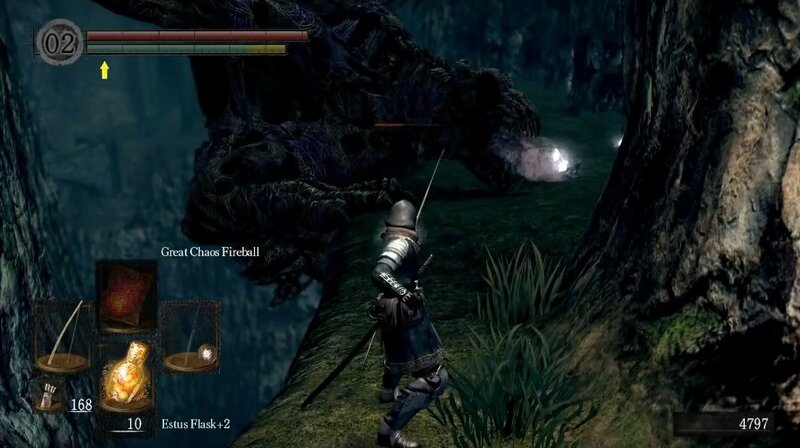 The Dragon can't move from it's spot and has limited range for all of it's attacks, which makes a ranged kill extremely easy, if difficulty is not a matter of patience. Position yourself, as in the picture below, to be effective with ranged attacks while reducing the Dragon's effectiveness to nothing. If you stand on the same ledge that leads to the narrow bridge, you can spam Lightning Spear to get in more damage; you do not need a lock on with the spell if you manually aim your character properly. Aim for its wings as it seemed to hurt it the most. Depending on your level this might take a while, but for 3000 souls, a Dragon Scale, and the items it was guarding, enduring a little tediousness is a small price to pay. Hyper Mode Strategy - Equip the Red Tearstone Ring, which is conveniently acquired nearby in the valley (please read below at "The End of the Valley" to find out how to get your hands on it). Lowering your HP below 20% will significantly increase your damage dealt, while being at no risk of death, if you keep the proper distance. The Symbol of Avarice may do the trick in reaching your optimum HP level. Even with a modest bow, it should take no longer than a minute of two to dispose this Dragon. If you have a melee weapon least moderate range (such as a long sword) then you can also engage the Dragon, mano-a-talon while not getting hurt too much. Start in the position, as in the picture below, and aggravate the Dragon any way you like. Wait for it to breath it's poison breath and then for the gas to dissipate before you run up and attack the closest foot (a running stab works well) with a single hit. Once your hit lands then roll back and run out of range of it's next poison breath (back to where you started), then repeat the process until you can remove the 'Un' from the Dragon's name. The Dragon won't attack until either, you do so first or pick up one of the items it's guarding. So just walk in to grab the item furthest away from where you plan to escape to, then dodge and roll for your life, as he'll do everything h e can to kill you once you pick up one. A nicely timed roll might save you from his attacks and enable you to the other item. If not, just run back and try again until you have looted both of the items. Continue on the ledge past the location of the -previously undead but now, more dead than undead - Undead Dragon to meet your first Drake! Drake? - These infantile Dragons are blue, relatively small (in Dragon terms), breathe lightning and can prove challenging in numbers - but luckily the first one is by itself and can't follow the ledge fully due to it's size. So the first one can be lured back along the ledge to a point where it can't follow, trapping it for a nice easy ranged kill. Once it's dead, continue onward and you'll find a small cave on the right as you go, where a corpse with a Humanity lies. Shortcut To Darkroot Basin - Head out, to a more open area of land, to find a Drake blocking your way across a bridge on your left, and an archway partly filled with rubble on your right. Climb up the rubble on the left side of the archway to discover a shortcut to Darkroot Basin via an elevator. Follow the passage at the top to find a bonfire and a Black Knight with a Halberd. One Too Many - Pass the Drake on the bridge, and you'll find the Brigand Armor Set and a Spider Shield on a corpse. Past the bridge await three more Drakes. Be careful here as the Drakes can kill you pretty easily if you attempt to take them all on at once, or try to leg it to and up the ladder on the right. Luring them one at a time, back to the larger area of land, will make for an easier exchange. NOTE: Even if you successfully manage to make it up, making it down is the issue. Fighting the drakes from this point is impossible as they would all crowd around the bottom of the ladder. 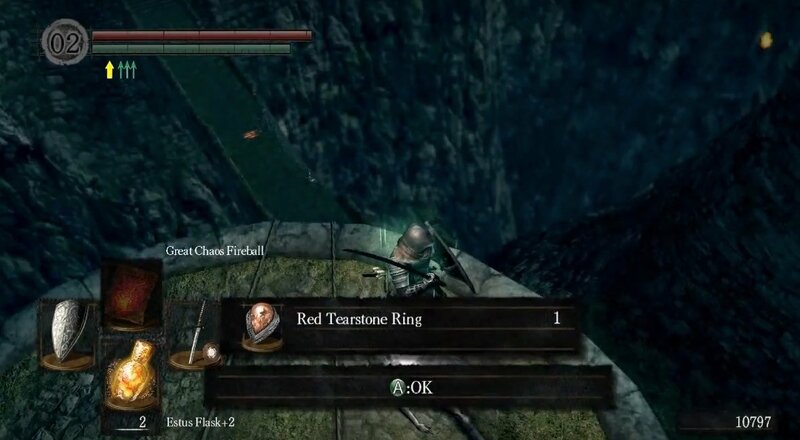 Red Ring - Once all the Drakes are dealt with, climb up the ladder on the pillar on the right, and acquire the Red Tearstone Ring - which can be very useful when dealing with the Undead Dragon, earlier on. When you make your way down, climb down and do not jump - you've acquired a lot of souls slaying these dragons and it would be a waste to lose them, at this stage. With the above all done, you have now explored the Valley of Drakes fully.